Looking to the future, SlashGear has installed a 64 MB flash drive in a MacBook Pro. Such a drive is expected to be the heart of the long rumored MacBook mini, now predicted for the January Macworld Exp. Why Buy a MacBook Pro When a MacBook Is Almost Identical? "Since Samsung helpfully pointed out that the 64GB SSD would work happily with Windows Vista, XP or Linux, we decided to answer the question most road warriors are thinking and install OS X on it instead. We're currently benchmarking it to see just how much of a difference solid-state can have on Apple's coveted range of laptops, so keep checking SlashGear for part two of our exclusive Samsung SSD review!" "The new Leopard operating system is locking up the keyboards of some MacBook Pro laptops, according to some users. The only apparent solution is to reboot the computer. "Messages posted in Apple's support forums claim the keyboard problem crops up only after moves to Mac OS X 10.5, and they say that it's intermittent. 'The keyboard will stop working and become unresponsive - the caps and num lock lights won't even turn on,' said a user identified as Cub man. 'Then after a few minutes, it turns on again and is fine until I let it sit for a while.'" "A while ago I had the pleasure of arriving home to a PowerBook drenched in soda, that's right, soda. I was furious, as everything was sticky from top to bottom, including the keyboard. Frantically I tried to dry it out using a hair dryer and accidentally burned a few keys to a crisp, but the damage was long done before I could do anything about it. Attempts to fix this PowerBook weren't so successful; many companies only replaced LCDs or upgraded the hard drive. PowerBook Medic, on the other hand, does everything. "I was surprised that the only repairs offered by retailers were CD/DVD drive upgrades, LCD repairs, and hard drive upgrades. The only alternative is buying the parts separately, albeit cheaper, and performing the repair yourself. 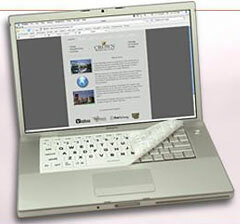 PowerBook Medic, however, incorporates both a wide selection of 'Book parts and experienced technicians." "Remember when low-end Macs were not as good as high end Macs? With Apple's quiet announcement of their new updated MacBook line I continue to be astounded that people continue to buy MacBook Pros. "This started a year ago when my wife announced that after years of using a PC she wanted to buy a MacBook Pro. So I started researching for her. I looked at graphs and charts on AnandTech and compared specs on Apple's own website. What amazed me was that the important specifications between the regular MacBooks and the MacBook Pros were nearly identical. At least in most of the ways that would effect performance for a casual user. Granted, there were differences, the Pros had the option to put in one more gigabyte of RAM, slightly better video cards, and were bigger in size, but these slight improvements didn't, in my mind, justify a nearly 100% increase in price between the models. So I advised my wife to buy a regular MacBook and we haven't looked back." Link: Why Buy a MacBook Pro When a MacBook Is Almost Identical? "Rumors that Apple was set to release an ultralight notebook computer real soon now have been circulating as far back as Dec. 2006. "Now it's pretty clear that 2007 will come and go without delivering on the rumors. "But in his latest report to clients, Piper Jaffrey's Gene Munster says he's 75% certain that an ultralight MacBook 'or possibly an entirely new product' will be coming in January at Macworld Expo." "In addition to the 'Santa Rosa' chipset, the newest MacBook sports the GMA X3100 integrated graphics chip. It's superior to the GMA 950 used in previous models of MacBook in that it supports hardware transform and lighting. It also supports vertex and pixel shader model 3.0 at 32 bit floating point per vector. And don't forget Anisotropic filtering of up to 16 samples. "Today we're posting results for some 'serious' professional graphics applications. "Conclusion: Not only is the new MacBook with the GMA X3100 a bummer for high rez gamers, it's going to disappoint pro users when running serious graphics intensive apps...."
"But will it run my 3D accelerated games at 'playable' speeds when high quality settings are used? "Conclusion: ...the new MacBook with the GMA X3100 is no 'barn stormer' when it comes to gaming at high quality and native resolution (1280 x 800)...."
"If a NitroAV 2-port Firewire800 card is installed, MacBook Pro computers may have issues waking from sleep mode. If this occurs, waking the computer from sleep mode requires shutting down and restarting. "In order to avoid this issue, remove the NitroAV 2-Port FireWire 800 Card before allowing the computer to sleep. Once the computer is awake and not in a sleep mode, you can reinsert the card and proceed." "MIT students have come up with a way to recharge your laptop without plugging it in. Rather than consuming electricity, you'll be burning calories - your own. "The pedal-powered laptop began as a class assignment for Course 1.102, Introduction to Civil and Environmental Engineering (CEE) Design (spring 2007), when students were instructed to design and build a device that converts mechanical power into electrical power." PR: The holiday season is a time for expressing thanks for all that we have and for giving to others who are less fortunate than ourselves. It's therefore the perfect time to participate in One Laptop per Child's Give One Get One program and help bring education and learning to the one billion children in the developing world who receive inadequate, or in some cases, no education at all. One Laptop per Child (OLPC) is a non-profit organization launched in 2005 by MIT professor Nicholas Negroponte to design, manufacture and distribute laptop computers that are sufficiently affordable and connected to the Internet, to provide every child in the world access to new channels of learning, sharing and self-expression. "Since announcing the Give One Get One program eight weeks ago, we've experienced a tremendous outpouring of public support," said Nicholas Negroponte, founder and chairman of One Laptop per Child. 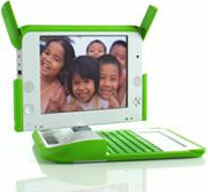 "OLPC is about learning not laptops. It is wonderful to see how many people deeply care about empowering children, who in turn are the world's most important natural resource." During the two-week period November 12-26, for just US$399, individuals who live in the USA or Canada can participate in the Give One Get One program to support the OLPC Foundation by paying for two XO children's laptops - one to give, one to get. The laptop you give will go to a child in Afghanistan, Cambodia, Haiti or Rwanda. The laptop you get can be used by you or a deserving child or friend. $200 of the Give One Get One contribution is tax-deductible as a charitable donation. The XO laptops will be delivered starting in December on a first come, first served basis. Go now to laptopgiving.org or call 1-877-70-LAPTOP (1-877-705-2786) to participate in this unique philanthropic opportunity. Masi Oka, star of NBC's hit ensemble drama series "Heroes," recently assumed the added role of goodwill ambassador for One Laptop per Child. "Anyone can be a 'hero' in real life," said Oka. "Participating in the Give One Get One program is a form of heroism - going above and beyond ordinary circumstances to help another human being in need. I encourage everyone to do what they can to support the work of One Laptop per Child and its efforts to improve children's education and connectivity to the world." The XO laptop comes with a built-in video camera, sophisticated sound processing, and software for making music, creating art, playing games, browsing the web and word processing. The XO laptop can also be used as an e-book reader in both the dark and in bright sunlight. 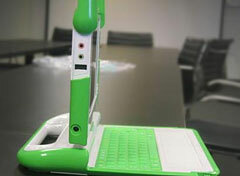 U2's The Edge has created a custom start-up sound for the revolutionary XO children's laptop. The sound welcomes children to the laptop's opening animation. The Edge said, "I'm delighted to support One Laptop Per Child, and its amazing aim to use this technology to help children all over the world." As a result of a partnership with OLPC, T-Mobile USA is offering one year of complimentary T-Mobile HotSpot access to people in the U.S. who donate an XO laptop to a child in a developing country through the Give One Get One program. T-Mobile HotSpot service provides fast and reliable Wi-Fi Internet access at more than 8,500 public T-Mobile HotSpot locations throughout the United States including at select Starbucks coffee shops, Borders bookstores, Hyatt Hotels, Amtrak stations and many airports. Electronic Arts Inc. has also announced that it will donate the original SimCity - the blockbuster 1989 game credited with giving rise to the city-building game genre - to each XO laptop. SimCity is entertainment that's unintentionally educational. Players learn to use limited resources to build and customize their cities. There are choices and consequences, but in the end, it's a creativity tool that's only limited by the player's imagination. One Laptop per Child is a non-profit organization created by Nicholas Negroponte and others from the MIT Media Lab to design, manufacture and distribute laptop computers that are sufficiently inexpensive to provide every child in the world access to knowledge and modern forms of education. These XO laptops will be rugged, open source, and so energy efficient that they can be powered by a child manually. Mesh networking will give many machines Internet access from one connection. The pricing goal is $100. 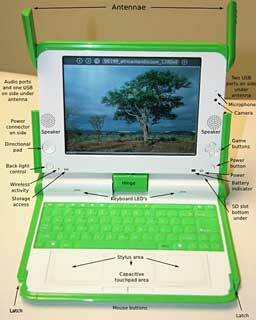 The XO laptops will be sold to governments and issued to children by schools on a basis of one laptop per child. Starting November 12 and for two weeks only, individuals in the U.S. and Canada will be able to participate in the Give One Get One program and for US$399 get a laptop while giving one simultaneously to a child in a developing nation. PR: VIsiSkin is a keyboard skin for Apple notebooks that protects your keyboard while making the key labels easier to see. 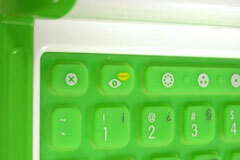 VisiKey VisiSkinis the first and only large print laptop keyboard skin. Made out of exceptionally durable silicone, it not only provides you with large print and visual relief, but also helps to protect your laptop from spills, dust, crumbs, and other foreign matter. 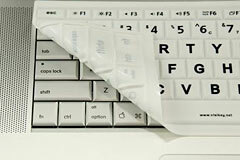 The soft and silky feel of VisiSkin covers also make typing easier, and quieter. Each model of VisiSkin is precision molded to be a perfect fit to that specific laptop model, so it requies no clips or adhesive to cling to your keyboard. If your VisiSkin gets dirty, just lift it off the keyboard, and gently wash in soapy water, and it will be as good as new. VisiSkin For Apple MacBook Pro [SKINMACBOOKP] $24.95 - VisiSkin For Apple MacBook Pro This skin fits the MacBook Pro, both 15- and 17-inch models. VisiSkin for Apple PowerBook G4 [SKINPOWERBOO] $24.95 - This skin fits the Apple PowerBook G4, including the 12-, 15- and 17-inch models. PR: MiniBatteryLogger is a Cocoa application designed to monitor your laptop battery and log all the relevant power events. The chart view shows the graph of charge and amperage over time, with customizable colors and indicators for relevant power events. Every change in power properties is logged to file with time and date of occurrence, and it's listed in the detailed log view. The Battery Inspector tells you all the details about your battery: charge, capacity (actual, maximum and original), amperage, voltage, cycle count. It also reports the estimated times to empty and to full charge. Share your battery data among MiniBatteryLogger users and compare your battery against the others. MiniBatteryLogger is interfaced to a shared battery data archive that can also be accessed by a Web interface. The application also notifies you about cord connections and disconnections, begin and end of charge with Growl notifications. A customizable threshold lets you be informed when the battery charge decreases under a given amount. Added support for MacBook (Late 2007) models. Delete snapshot button now correctly disabled when no snapshot is selected.